Indian Army Notification is out. Indian Army is recruiting for 191 Engineering Graduates Posts. You can check Indian Army - Indian Army last date, download Indian Army notification, visit Indian Army official website and check other Indian Army Vacancy details.Complete Vacancy and recruitment Details about 191 Engineering Graduates vacancies in Indian Army are provided below by JobSarkari.Com only for you. Last Date of Apply Online. 09/08/2018. Last Date of Receipt of Application (Only For Widows of Defence Personnel). 30/09/2018. Civil. Candidate Must Have Passed Civil Engineering, Civil Engineering (Structual Engineering), Structural Engineering. 48. 04. 52. Mechanical. Candidate Must Have Passed Mechanical Engineering, Mechanical (Mechatronics) Engineering, Mechanical And Automation Engineering. 16. 03. 19. Electrical/ Electrical And Electronics. Candidate Must Have Passed Electrical Engineering, Electrical Engineering (Electronics And Power), Power System Engineering, Electrical And Electronics Engineering. 22. 02. 24. Aeronautiocal/ Avaiation/ Ballistics/ Avionics. Candidate Must Have Passed Aeronautical Engineering. 12. 00. 12. Computer Sc And Enginerring/ Computer Technology/ Information Tech/ M.Sc Computer Sc. Candidate Must Have Passed Computer Engineering, Computer Science, computer Science Engineering, computer Science And Enginnering, Information Science And Engineering, 31. 03. 34. Electronics and Telecom/ Telecommunication/ Electronics And Communication/ Satellite Communication. Candidate Must Have Passed Electronics And Telecommunication Engineering, Telecommunication Engineering, Electronics And Communication Engineering, Electronics And Electrical Communication Engineering. 28. 02. 30. Electronics/ Opto Electronics/ Fibre Optics/ Micro Electronics And Microwave. Candidate Having Power Electronics And Drives. 11. 00. 11. Production Engineering. Not Specified. 03. 00. 03. Architecture/ Building Construction Technology. Candidate Having Architecture Engineering. 04. 00. 04. For Widows of Defence Personnel. SSCW (Non Tech) (Non UPSC). Candidate Must Have Passed Graduation in any Discipline. 00. 01. 01. SSCW (Tech). Candidate Must Have Passed BE/ B.Tech in Any Engineering Stream. 00. 01. 01. Total Vacancy. 175. 16. 191. Minimum Height of Men is 157.5 cm. Height Relaxation is 5cm For North East And Hilly Areas Candidates And 2 cm For Lakshadweep Candidates. For SSC (T) Men And SSCW (T) Women. Minimum 20 Years And Maximum 27 Years (Candidate Must Have Born Between 02/04/1992 and 01/04/1999). For Widows of Defence Personnel. Max 35 Years (As on 01/04/2019). 2. Candidate Need to Read All The Instructions Carefully Before Applying The Post. 3. Candidate Need to Click on Apply Online Link As Given on Our Website in Important Links Section. 4. Candidate Need to Register Themselves Already Registered Candidate No Need to Register Again. 5. Candidate Need to Fill All the Details in Application Form. 6. Candidate Need to Upload All The Mandatory Documents, Passport Size Photos And Signature As Prescribed Size And Format. 7. Candidate Need to Apply Online Before 09th August 2018. 8. Only For Widows of Defence Personnel Candidate Need to Send the Application With All Mandatory Documents Like Cast Certificate, And Photos As Mentioned in Notification. 9. Widow Candidate Need to Send the Application Form on the Given Address Before 30th Sept 2018. Q. 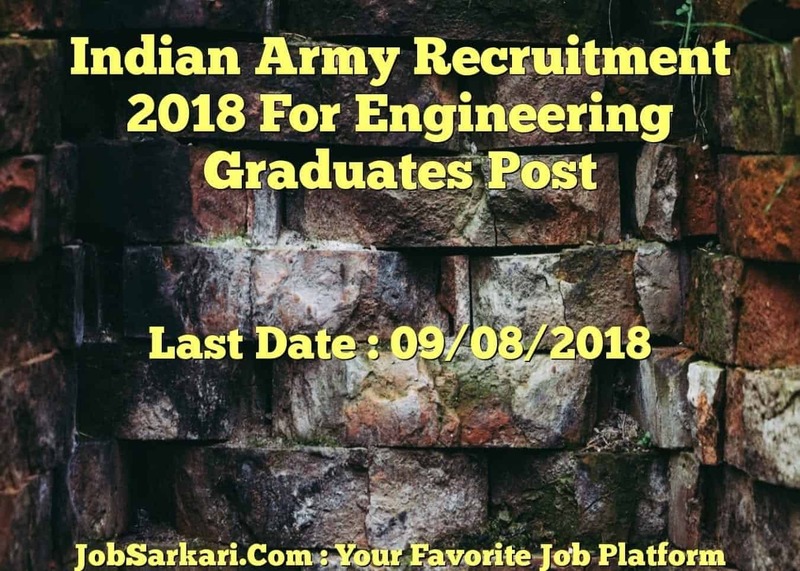 What is the Last Date For Indian Army Engineering Graduates Vacancy ? A. 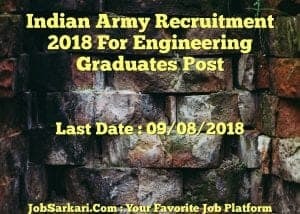 Last Date for Indian Army Engineering Graduates Posts is 09/08/2018. Q. What is the Form Type of Indian Army Engineering Graduates Recruitment ? A. The Form Type for Indian Army Engineering Graduates Posts is Offline, Online. Q. How many vacancies are available in Indian Army Engineering Graduates Posts ? A. There are about 200 Vacancies in Indian Army Engineering Graduates Posts.